If you haven’t seen or played around with Wordle, you may want to check it out! It is a simple site in which you insert text into a box and it creates a word cloud. The clouds give greater prominence to words that appear more frequently in the text. You can tweak your clouds with different fonts, layouts, and color schemes. You can print them out, or save them to the Wordle gallery to share with others. 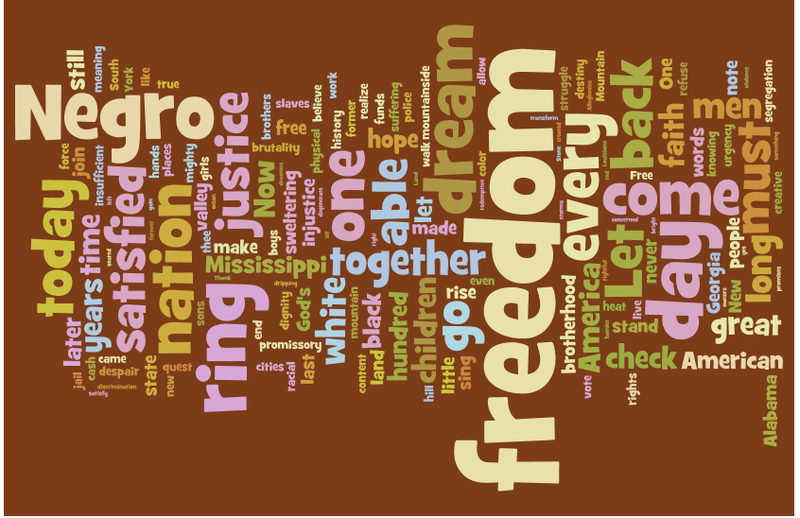 I made a Wordle on the left with Martin Luther King’s I Have a Dream speech. I just copied the text and then played around with some layouts, fonts and colors. You can see the same speech portrayed in two different ways. ** Keep in mind that the Worlde gallery is not censored, and there may be inappropriate content found in the galleries. Hope this doesn’t hinder you using this in class!